I've been waiting so long for something like this to happen, and it finally has. My mom made a comment on my new Facebook profile picture, and someone else in the family yelled at her. I hadn't even seen this until I got an email from her saying sorry she said it but that she was shocked my belly was hanging out! 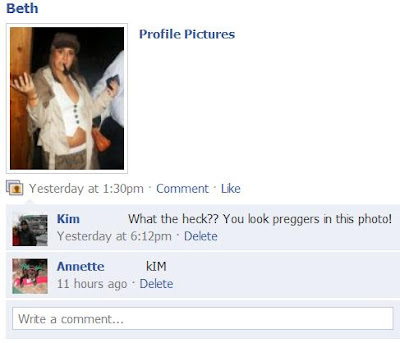 First of all- Thank you Aunt Annette for realizing it may not be the best thing to say to your daughter on her Facebook. Especiall your daughter that has a blog. Second, MOTHER [She hates when I say that]... I'm not preggers, you don't have to worry. I was simply rockin' the beer gut, which if you didn't know, is totally the in thing nowadays. Ohh the combination of family, Facebook, and FAIL. F-cubed. It's beautiful.